Franklin-Christoph Model 27 Collegia | Inkdependence! 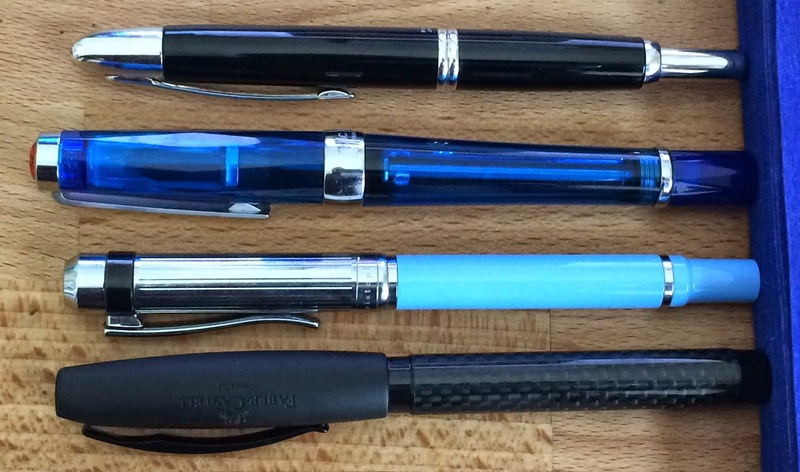 I get asked (pretty often) what my favorite pen is. My usual response was that I didn't really have a favorite; that it was like choosing between my kids. Then, a little while ago, I started keeping track of which pens I took with me most often. I've always got a couple of them on me, but one of them kept popping to the top of the list. The Franklin-Christoph 27. I've always really liked this pen, but I never noticed just how often I put it in my pocket. Anyway, enough history. Let's look at this pen. Most of the 27s come with a chromed cap, but you can get a radiant red one that is red with silver and black accents. I like the chrome cap best, I think. It's classy despite the bright body-color. The whole body of this pen is machined from brass (I think), and then painted (powder-coated I think). It's a substantial pen, and the finish is nearly flawless. I mentioned that I throw this one in my pocket all the time, and there isn't a scratch to be found on this pen. It's durable, yo. You can see lots of threads in this barrel, and it takes a while to un-twist the section from this pen. Very secure, but don't try to eye-dropper this pen. This is the end cap of the pen, and you can see a little bit of wear on the threads. That's the only place that the metal shows through the paint, and you won't be seeing that. You can see the brass inside the cap, though, and that's cool. With the converter installed you can see, and twist, the piston without taking the barrel off of the pen. Just unscrew the end cap to access the converter. That's convenient if you need to prime the nib (though I almost never have to do that with this pen/nib). I've got pretty large hands, and you can see that it fits perfectly into the web of my hand. It's a good length even unposted. Posted, it's pretty long. It's not as long as a posted Faber-Castell Basic, but it's just a little shorter than a posted TWSBI Vac 700. With the heavy cap, it's kinda unwieldy to use posted. Here's the pen compared against a couple of others. The nib is my favorite thing about the pen, though. It's a Masuyama broad cursive italic, and it's awesome every time. It's a fairly small broad, I'm guessing about a .9mm, and I use it all the time. These are the smaller #5 nibs, and it fits this pen's size really well. The #6 nib would look kinda crazy on this body. The nibs I have are their "high-performance steel" nibs. I like this Masuyama nib just as well as any gold nib I've used, and more than most of them. The regular nibs are just fine, but the extra money for the special ones is well-spent. It's an extra $15, but you'd pay about $40 for the same customization at a show. Frankly, I can't see getting a Franklin-Christoph without a custom nib. If I have to complain about anything on this pen, it would be the section. It's got two problems for me, though neither of them are deal breakers. Firstly, it's a little skinnier than I wish it were. My fingers would be more comfortable if the grip were a little wider. It's not uncomfortable (or it would be my favorite pen), but it could be a little bigger. Secondly, I think there are too many twists required to remove the cap. This is a nuisance if you're a person who tends to cap and uncap the pen over and over. My wife prefers snap-on caps for exactly that reason. Other than these two things, this pen is pretty perfect. I know some people aren't too psyched about a metal section. They can be slippery at times. This one, though, isn't. It's never slipped on me. Maybe the paint helps to prevent that? The cap on this pen is large, and fairly heavy. The cap is a little top-heavy because of the spring action built into the clip. That means that it's a little back-heavy if you post it, but I just don't bother to post it. It's nicely styled without a ton of branding. You've got the four diamonds on the clip, a tasteful "Franklin-Christoph" around the bottom of the cap, and a small "F" with diamonds on the top. I'm not a huge fan of branding, but this stuff is unobtrusive. The pen itself is distinctive, and that's probably all the branding that Franklin-Christoph needs. The clip is excellent. It has enough of a swoop to it that it can easily clip on to jeans pockets or whatever. It's also spring-loaded so you don't have to worry about it bending and losing it's spring. I can see some micro-scratches in the very top of the cap. Interesting that there are scratches there, but no real dings in the paint. Oh well. I don't see them unless I look very closely. You can't really get these pens in very many places. I'm pretty sure they're only sold in one shop (Oragami Ink), and they don't sell online as far as I know. If you're in Ashville, NC, though, you should certainly go there. They run $69.50 with a regular steel nib, $84.50 with a steel Masuyama nib. The gold nibs will run $80 more. For your very own Model 27, visit the Franklin-Christoph site. Thanks for posting this - I passed up on one of these when Massdrop were 'selling' them, partly because I'd never seen them. On closer inspection, though, it's pretty impressive! Yeah, it's a great pen for the money. I didn't see the Massdrop, but I might have gone for another one. Thanks for the heads-up, Jordi. I don't know what happened, but they all disappeared. I've got it fixed now, though.